The Keysight N8736A is available to buy refurbished used or rent, usually from our UK stock. Click here to download the Keysight N8736A datasheet. The Agilent Technologies N8700 series system DC power supplies give you just the right performance at just the right price in a compact (2 U) package. This family of affordable 3300 W and 5000 W single-output programmable DC power supplies consists of 21 models for simple DC power applications. They provide stable output power, built-in voltage and current measurement, and output voltage and current from 8 V to 600 V and 5.5 A to 400 A. These economical supplies offer many system-ready features like multiple standard I/O interfaces to simplify and accelerate test-system development for R+D, design validation, and manufacturing engineers in the aerospace/defense, automotive, component and communications industries. The N8700 provides up to 5200 W in a small space-saving 2 U-high, 19- inch-wide package. Its air vents are in the front and rear (not on the top or bottom), so you can stack other instruments directly above or below it to save valuable rack space. 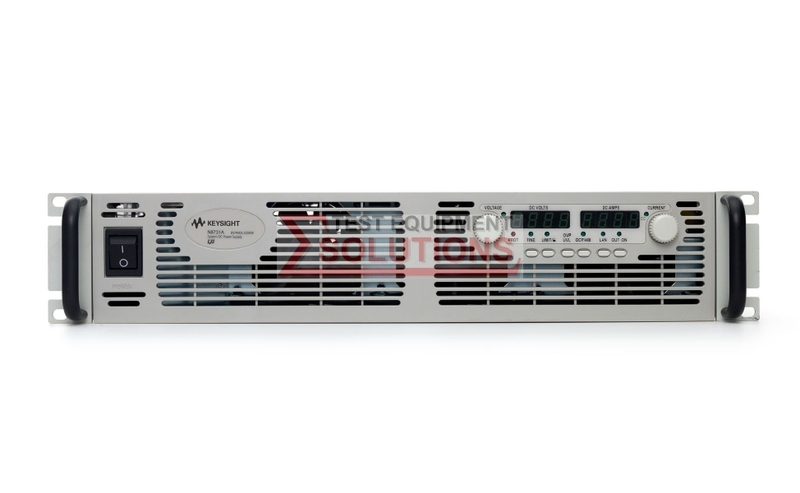 We offer the refurbished used Keysight (Agilent) N8736A 40V 85A 3400W DC Power Supply for sale and rental. The Keysight N8736A is fully tested and refurbished in our in-house ISO9001 calibration laboratory. We supply manuals, accessories, full warranty and a free-of-charge Certificate of Conformity. We can also provide the Keysight N8736A with a fresh calibration for a small additional charge. If you have under-utilised test equipment talk to us about trading-in or part-exchanging it towards the Keysight N8736A or other refurbished test equipment.